Around 1 p.m., the California Highway Patrol received calls reporting the seal was blocking the slow lane of Highway 37. The seal climbed out of an inlet of San Pablo Bay, crossed two lanes of traffic and attempted to climb over the center divider. CHP Officer Andrew Barclay said the CHP received reports that drivers stopped and tried to assist, and the seal attacked them. There is no food or water on the other side of the road, and officers do no know what the female seal was looking for, Barclay said. The seal appears to be in perfect health, and experts say she might be pregnant. 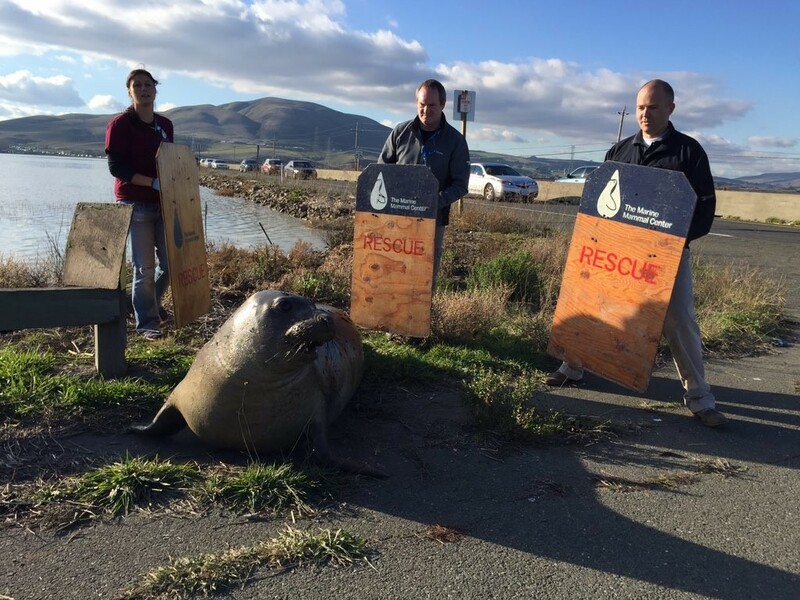 CHP officers worked with two rescue teams and Fish and Wildlife personnel to persuade the seal to swim away. Rescue workers managed to usher the seal into the water, but the animal repeatedly wandered back to land. Officers stopped tracking the seal shortly after 7 p.m. when it became too dark for rescue operations. On Tuesday morning, the seal was still swimming near the highway and showed no signs she was leaving. The CHP says it might shut down the two-lane highway if the seal tries to charge across again. Barbie Halaska, a research assistant at The Marine Mammal Center, said as a last resort, workers would sedate the seal and use a lift to take her to a suitable location for release. Caltrans is so behind that they will go to great lengths to get a public seal of approval. The money would be better spent on asphalt and crosswalks. I long for the day when a chicken…errrr…seal…can cross the road without having its motives questioned. you need to live in Denver where the geese attack you on the way/walk to work. and……….would someone take me to a suitable place? He / she was going wine tasting. Shoot it if it does it again.